If you were to choose a topic for cordial, evidence-based dialogue, it probably would not be religious approaches to family planning. Yet that was on the agenda at the Ouagadougou Partnership (OP) meeting in Conakry, Guinea last week. Some 19 religious actors and leaders were among the 350 participants at the sixth annual meeting of the Partnership. It brings together the governments and civil society representatives of nine francophone West African countries (Benin, Burkina Faso, Côte d’Ivoire, Guinea, Mali, Mauritania, Niger, Senegal, and Togo) with key donors, USAID and the Bill & Melinda Gates Foundation among them, and various “partners” (mainly nongovernmental organizations and firms). The religious actors are slowly coming to be recognized as important players in this critically important effort to make family planning services available in the region. This is important because this sub-region has the world’s highest fertility rates and fastest growing population, with an average of 5.5 children per woman. Use of modern contraceptives is low and about 25 percent of married women age 15-49 would like to space or limit births but are not using modern contraceptive methods, often because family planning services are not available. A result is very high rates of maternal and child mortality: 225 women die every day while giving birth, and for every woman who dies, approximately 30 others suffer important complications. French President Macron caused a storm last summer when he stated baldly that with such high population growth rates the region could not escape the poverty trap, but during the Conakry meeting several leaders recognized that what he was saying, while tactless, was nonetheless true. Barely touched on during a highly technocratic meeting centered on family planning objectives were the harsh realities of youth migration north, the temptations of radical ideologies, violent conflicts in some areas, and the very real threats of climate change. But the issues are tightly interconnected. Engaging religious leaders is a relatively new area of focus in the OP program. The World Faiths Development Dialogue (WFDD) is among the organizations that hold that without engaging religious actors and issues progress is difficult on many topics but especially family planning. From individuals making decisions about whether they want to have a child then to the global stage at the United Nations, religious beliefs are one of many influences. They can be positive, supporting responsible parenthood and loving family relationships, or negative, harshly condemning family planning approaches as anti-religious or blocking education about reproductive health. 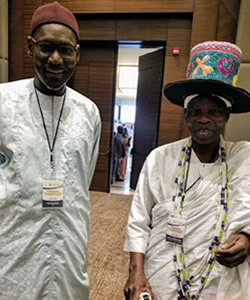 WFDD is engaged in a pioneering and promising strategic interreligious project in Senegal that is demonstrating that the door is wide open to dialogue, if it is built on knowledge and mutual respect, but also points to some especially sensitive areas. At the OP conference, Sheikh Saliou Mbacké (CRSD), who leads the Senegal project, speaking on religious roles in family planning, emphasized the shared concerns of all partners for family welfare and importance of religious actors on many dimensions of the topic. He called for recognition of the diversity of religious approaches and the importance (and complexity) of the relationships between culture, societies, and religious institutions. He was peppered with challenges and questions, especially from the group of youth leaders, highlighting some of the sticky topics that arise. While there is no single religious position on family planning (in either Islam or Christianity, the two main religious traditions in the region), adolescent sexuality outside marriage is an especially uncomfortable topic across the board, as is education about reproductive health. The perils of early and forced marriage are only now making their way into the religious discussion as a topic for which they can take responsibility. Female genital cutting (FGC), widely practiced in parts of the region, is explained by some (falsely, vehemently argue most religious leaders) as required by religious teachings. A central topic of the OP meeting was women’s empowerment, translated into French as “l’autonomisation de la femme”. That term generated considerable discussion: what in fact is meant? Can someone be “given” autonomy? And there were obvious doubts as to whether it is a good thing anyway. One common (if obvious) conclusion was that men must be involved. This has implications for the religious engagement, because the region’s formal religious leadership is almost exclusively male. An important lesson has emerged from WFDD’s Senegal experience here. Although a first answer to seeking women religious leaders is that there are none, in fact significant and influential networks and leaders play vital roles and can help bridge what seem deep gulfs between “empowered” women and traditional religious leaders. Further, religious institutions can draw men to discussions of sensitive topics and open the door to different kinds of exchange and learning. In this region, religious management of health facilities is quite limited and public health challenges abound (the Ebola crisis began in Guinea). The important links between women’s roles in the family, girls’ education, maternal mortality, primary health care, child nutrition, out-of-wedlock births, and family planning are not always obvious, nor are the roles that religious leaders can play to advance specific projects and programs in each area. But all these topics touch core values and religious beliefs and teachings play important roles. The Ouagadougou Partnership is wise to include religious leaders in the discussion, notwithstanding the sensitivity and complexity of the religious landscape and real potential for backlash if their engagement is not handled with care, knowledge, and respect.